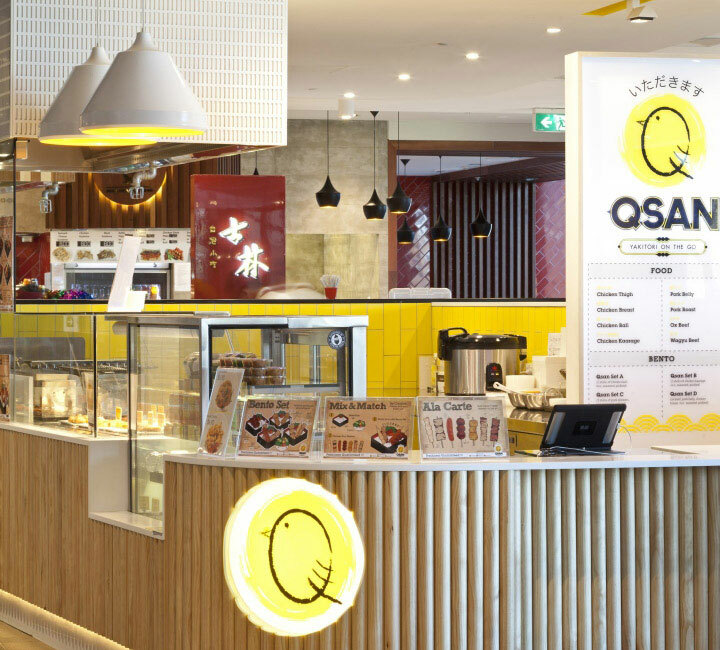 Bright, clean and youthful – this is the design formula that the Sidney-based firm Morris Selvatico used in order to attract the young local clientele to the Qsan kiosk. 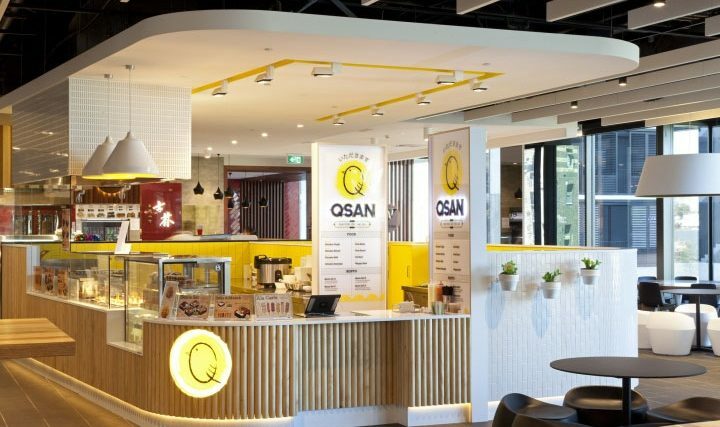 Located in the food court at One Central in Chippendale, Sydney’s “cool” neighborhood, Qsan is a Yakitori express store that introduces this Japanese treat to customers in search of something different. 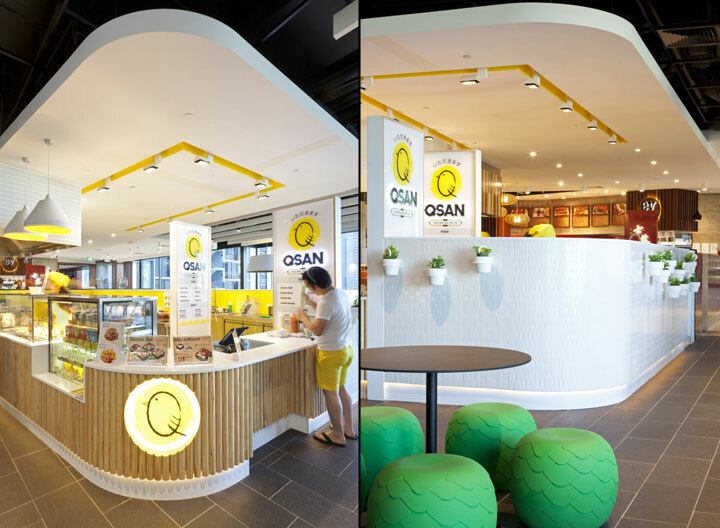 The kiosk is located in the proximity of a university campus, so the design was kept modern, fresh and quirky in order to respond to young tastes. Yellow and white are complemented with natural tones, so that the result is a space that looks sunny and inviting. Solid timber dowels arranged vertically cover the sides of the counters, bringing to mind the wooden skewers used for making Yakitori. The curves of these cylindrical elements are echoed in the soft curves of the counters. These are topped with white Corian, a thermoformable material perfect for commercial spaces where stains, cuts and scratches need to be kept at bay or easily repaired. Inside the kiosk, yellow tiles offer the space the necessary chromatic contrast. 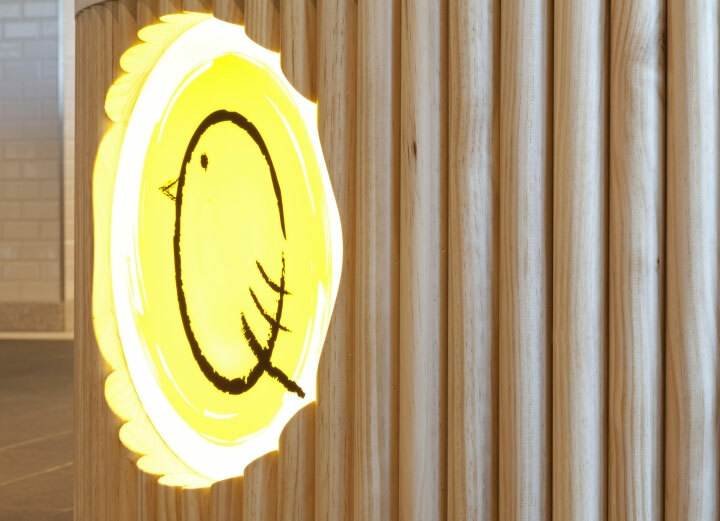 Other elements are using the same yellow to create a cohesive design: the recessed ceiling troughs, the pendant lighting and the menu. 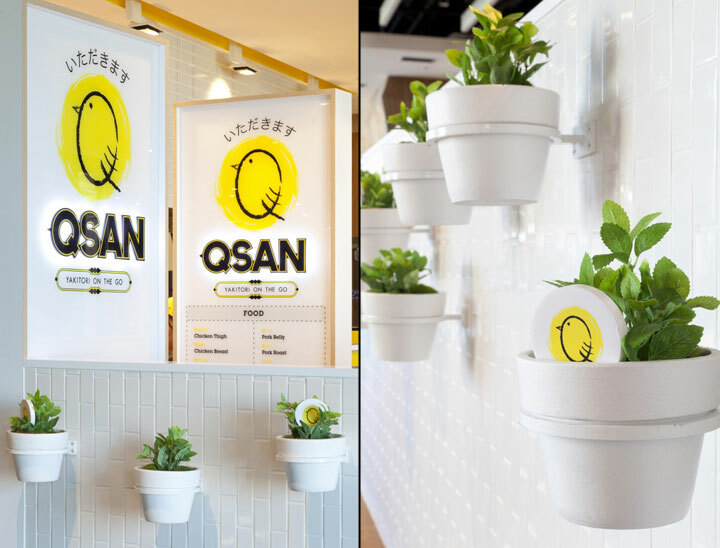 The playful Qsan logo, the source of this chromatic choice, is generously displayed in various sizes and several locations, so that it makes an impression on the customer. White herb pots bring a charming touch to the design. Set against a crisp white wall lined with tiles, the herbs evoke a kind of familiarity similar to that brought to mind by the presence of flower pots on a sill. The vertical tiles are a clever choice that gives an unexpected elegant flow to a simple wall.